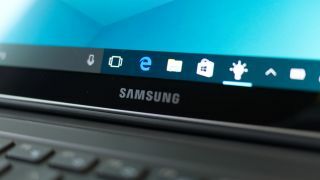 At MWC 2017, Samsung confirmed the rumors of it building a super-premium, Windows 10 2-in-1 laptop in the vein of Surface Pro with the announcement of the Galaxy Book. A 12-inch 2-in-laptop with a Super AMOLED screen and Intel’s latest (Kaby Lake) Core i5 U series processor, the Galaxy Book is Samsung’s answer to Microsoft’s latest tablet hardware. The Galaxy Book is essentially Samsung’s update to its Galaxy Tab Pro S of last year, which we enjoyed quite a bit. This version’s marquee feature, however, is a Samsung S-Pen – a Samsung first on Windows – that doesn’t need to charge. Rounding out the spec sheet are up to 8GB of RAM and as much as 256GB of flash storage, all lasting for as long as 10 hours on a fast-charging battery. Oh, and this model does the Surface Pro 4 one better with two USB-C ports. All of this comes in a 754g, 7.4mm-thin slate that can last up to 10.5 hours and sports fast charging. The Samsung Galaxy Book will be available with up to 8GB of RAM (4GB starting) and as much as 256GB of storage (128GB starting). But wait, there’s more. Samsung also announced a 10.6-inch option, equipped with an FHD (1,920 x 1,080) with TFT technology, an Intel Core m3 processor, 4GB of RAM, 128GB of storage (64GB starting) and a battery with fast charging that can last up to 10 hours. You’ll enjoy USB-C as well as 802.11ac and optional LTE connectivity on both models, though the 12-incher holds a 13MP rear camera as well as the 10.6-incher’s sole 5MP webcam. Sadly, Samsung is still keeping mum on when these two Windows tablets will land or for how much. For that, you’ll have to stay tuned to TechRadar.